The Casio CP-300 CCD camera. We've heard about this some time ago and did not want to include it on our website as it is merely a gadget or toy. Then we saw that some people with no knowledge whatsoever tried to rip people off on eBay with this item and that's something we cannot tolerate, so here is all you need to know about the Casio CP-300. In 1994 Casio marketed some label printers under their Name Land label. These label printers were intended for domestic and business use. The business models carried the add-on 'Biz'. We are mainly talking about the models Casio KL-3000, KL-5000 and KL-8000 here. The KL-8000 being the flagship for quite a while. As you know the japanese tend to pep things up with pictogramms and pictures. So, Casio thought it would be fun for the user to take a snapshot and print it out on one of their KL printer models. They went ahead and built the Casio CP-300 CCD camera. The Casio CP-300 CCD camera is not a stand-alone camera, it has only a volatile buffer memory inside. The camera is operated with two AAA batteries and is connected to the side of the KL label printer via cable. The CP-300 was introduced in 1994 as an accessoire for above mentioned label printers and although it has a CCD the camera does not have an A/D converter. The charge of the CCD goes directly into a buffer memory chip and then goes as signal output to the label printer. The camera could only record in black and white and the image is of extreme low quality, only 8-bit. The price of the camera was 19,800 Yen when it was marketed and since the most of the label printer users deemed it an unnecessary gadget, not too many were sold either. Every now and then the camera surfaces for a ridiculous low price between $8 and $25. The CP-300 in fact completely equals the so-called Nintendo Gameboy pocket camera and operates in the same manner. 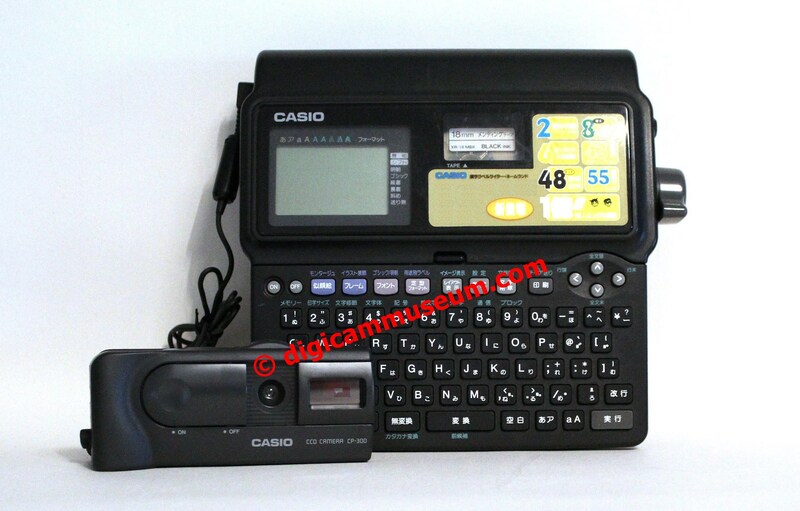 The label printers and the CP-300 CCD camera were only marketed in Japan during the second half of the 1990s.The camera has nothing to do with the development of the Casio VS-101 or the Casio QV-10 digital camera. It was built by a completely different division and is an entirely analog product used for fun. I attached the page from the original 1995 Casio brochure where the Casio CP-300 is listed as an accessoire (page 28) for those who always doubt everything. Oh and better pictures will follow once I unearth my box again. Thanks to Andrew for pointing me towards most of the information and helping me in demystifying this item.